Presents practical guidance on arthritis and joint replacement, polypharmacy and mobility, swallowing dysfunction, nutritional recommendations, psychiatric and cognitive disorders, assistive technology, and more. Covers the physiologic changes and epidemiology of aging, osteoporosis and fragility fractures, fall prevention and intervention, and prevention of hospital-acquired deconditioning. 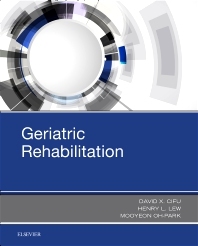 Consolidates today’s available information on geriatric rehabilitation into one convenient resource.